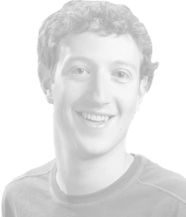 Dilara O'Neil - "Mark Zuckerberg's Significant Insignificance"
Reflecting on one early profile photo. Melissa Lo - "Consequences of the Frame"
On the Instagram acquisition, and images of the workplace. Ethan Zuckerman - "Zuckerberg and the Imaginary Cosmopolitan"
Thinking about Mark Zuckerberg's favorite map. Tamara Shepherd - "Neocolonial Intimacies"
About the geopolitics of an awkward hug. Mél Hogan - "Sweaty Zuckerberg and Cool Computing"
On bodies, hoodies, and a look back at one sweaty interview. Li Cornfeld - "Fireside Chats, Tech Spectacle, and the Making of Mark Zuckerberg"
Observations on the depiction of men - at desks and on stage.